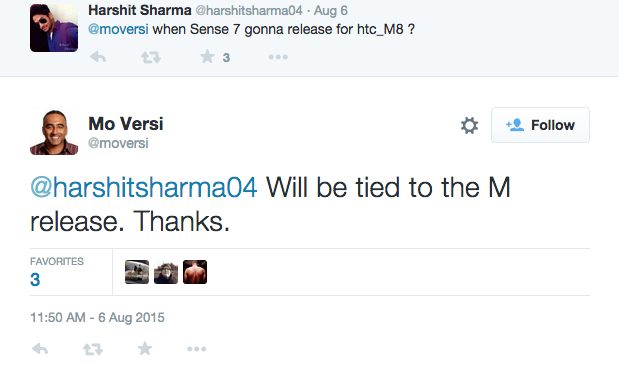 Over the weekend, owners of the One M8 learned some frustrating news, as HTC’s Mo Versi tweeted that the Sense 7 update will be tied directly to the release of Android M. Back in April, HTC UK declared on Twitter that Sense 7 would roll out in August. From what we can gather, it appears HTC will not be updating the One M8 to Android 5.1, and instead, will wait for Google to ship out final code of Android M to OEMs and then bake Sense 7 into that. For users, this is bad, as HTC was once extremely transparent on updates, even promising updates to the latest versions of Android within 90 days. Even though waiting for Android M is not a bad thing technically, Android 5.1 included a few important security fixes for Android, as well as battery optimizations. To skip over it completely comes off as a weak move, in the eyes of consumers. Sense 7 is currently available on the latest device from HTC, the One M9. It appears One M8 owners will need to show a bit more patience until they receive it, especially if it means having to wait for Android M. Strap in, folks, it could be a long ride.